This men’s Curtis shirt is a fresh take on smart casual dressing. 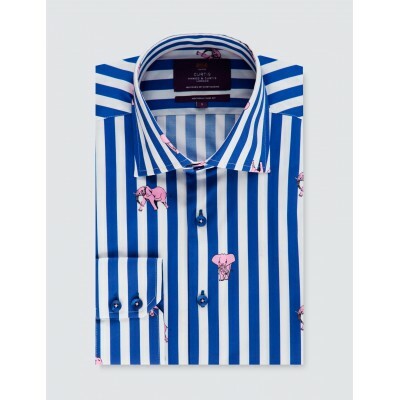 It features bold white and blue stripes with a pink elephant print. Designed with the modern man in mind, this Curtis shirt has been specially engineered to flatter your physique whilst maximising comfort. Crafted from luxe combed cotton fabric with added stretch, this high-performance shirt allows full freedom of movement. The slim fit is gently tapered across the waist and chest, creating a relaxed yet defined silhouette. Finer details include single cuffs, a smart semi-cutaway collar and a pink trim inside the collar. Team with chinos and moccasins for a statement look. Рубашки Jermyn Street это основная коллекция в нашей линейки. Создана для современных джентльменов, с учётом всех особенностей. Манжеты на пуговицах, выполнена из двухслойного высококачественного хлопка. Ткань ёлочка. Имеет уникальное шёлковое покрытие, поэтому ткань мягкая и гладкая. Двухслойны..
85% cotton 15% polyamide Comfortable, fun and just a little bit quirky, these men's Union Jack socks will liven up your sock drawer Reinforced heel and toe with comfort seam.. The Details This is a stylish white twill shirt for the modern gentleman. This slim fit shirt is made from the finest two-fold cotton and has been finished with the latest non-iron technology. This new Jermyn Street shirt has been crafted with an immaculate smart semi-cutaway collar and single cuff..
100% soft cotton shirt with a special finish that keeps you cool, dry, and comfortable all day. Do keep up. Stuffy commutes are old news (thanks to last season’s Natural Cool shirt), so this season we’re turning our attention to keeping chaps cool at downtime. Enter: Soft Wash Tyrwhitt Cool Shirt..